Existing Customers - Coming Soon! Arizona's 1st Certified Feline Master Groomer! Gabi is a Certified Feline Master Groomer, Cats Only Mobile Grooming. The 1st CFMG in Arizona, Gabi Kat Grooming is the only feline/cat exclusive groomer in Tucson. May 1st of 2017 marked our 5 year anniversary of business operation in the local community. Please call (520) 260-6650 for information and (520) 403-5910 for scheduling appointments (call or text). You can also email cheryl@gabikat.com for appointments, or use our handy Contact Form to get in touch with us. We also do require that your cat is up to date on rabies vaccinations before we groom. We offer a wide range of grooming choices, from full coat grooms to lion cuts and teddy bear cuts. We also provide optional additions such as sanitary cuts, full belly shaves, and de-shedding. We are experienced with a variety of cat breeds including short hair, long hair, and Persian. 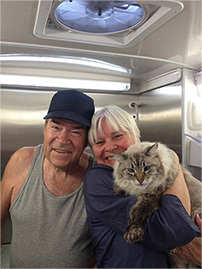 We only groom cats and "we come to you" in our mobile grooming van, which brings convenience to you and comfort to the cats that don't like to travel away from home. I have a long-haired Persian that gets mats very easily, and Gabi Kat was my solution for keeping my cat happy and mat-free! I would recommend them to anybody looking for convenient and trustworthy mobile cat grooming services. My lovely Olivia had her bi-monthly grooming yesterday!! She looks wonderful and is so happy and so energized by being all fresh and clean! Thank you, Gabi Kat Grooming! The employees are very professional and friendly, and they take good care of my kitty. They even call to let you know their estimated arrival time, and there are reminders the day before the appointment so you don't forget. Is your cat clean? Do cats like getting a bath? What soaps and shampoos do we use, and why? What causes matting? How does Gabi Kat Grooming dry the cats? You can find answers to these and many other questions by vising our FAQ page. Our mobile-friendly website is still under construction and will be coming soon. In the meantime, please continue to use our older website for viewing this page on smartphone devices by clicking here. Copyright © 2017 - 2019, Gabi Kat Grooming. All rights reserved.